What an amazing truth to live throughout this day knowing you are surrounded by the Holy Trinity! How needy we are for the marvelous, unending, grace of our Savior. Saturate yourself in the love of God this morning. As Saint Augustine, C. 400 AD said, "Our hearts are restless until they find their rest in you." Find your rest in His love today. What an amazing privilege to be able to have constant access to the Holy Spirit. If there are feelings of loneliness being alone know you are not alone, and if you are a follower of Christ, you are never, ever alone. The Holy Spirit lives inside of you. Why would anyone reject the Trinity?? Seek the truth of God’s Word to know the truth. You cannot rely on anyone or anything else. 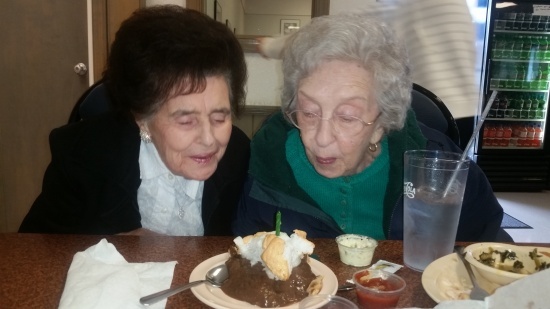 Photo of my Mom about to turn 88, and my dear Aunt Virginia turning 84 blowing out the candle on a birthday dessert. These two lovely ladies have meant a great deal in my life!